By Keith Cowing on December 16, 2017 10:10 PM. "The Trump administration is prohibiting officials at the nation's top public health agency from using a list of seven words or phrases - including "fetus" and "transgender" - in any official documents being prepared for next year's budget. Policy analysts at the Centers for Disease Control and Prevention in Atlanta were told of the list of forbidden words at a meeting Thursday with senior CDC officials who oversee the budget, according to an analyst who took part in the 90-minute briefing. The forbidden words are "vulnerable," "entitlement," "diversity," "transgender," "fetus," "evidence-based" and "science-based." In some instances, the analysts were given alternative phrases. Instead of "science-based" or "evidence-based," the suggested phrase is "CDC bases its recommendations on science in consideration with community standards and wishes," the person said. In other cases, no replacement words were immediately offered." A spokesman for the Health and Human Services Department said Saturday the agency remains committed to the use of outcomes data and scientific evidence in its decisions, pushing back on the characterization of a Washington Post report that the Centers for Disease Control and Prevention is now banned from using words like "science-based" and "transgender" in budget documents. The spokesman, Matt Lloyd, didn't respond to follow-up questions about whether the policy might apply more broadly, now or in the future, to other HHS agencies such as the Food and Drug Administration or the National Institutes of Health. A separate FDA spokeswoman said earlier on Saturday that the FDA hasn't yet received or implemented a policy to avoid certain words in budget or policy work. 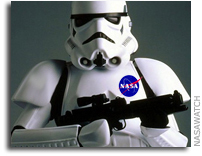 Keith's note: What science-related words might be banned at NASA? "Science-based" or "evidence-based" seem to be natural ones since CDC can't use them. "Climate change" is also a no-brainer since NASA studies a planet called Earth and NOAA and EPA have already had some guidance on that. With regard to Astrobiology "origin and evolution of life" might be a ripe target too. On the other hand, maybe we'll get lucky and NASA will be forced to stop saying "notional" on every powerpoint slide they show and say "we're just guessing" instead. CDC gets list of forbidden words: fetus, transgender, diversity, Washington Post\n\n\"The Trump administration is prohibiting officials at the nation's top public health agency from using a list of seven words or phrases - including \"fetus\" and \"transgender\" - in any official documents being prepared for next year's budget. Policy analysts at the Centers for Disease Control and Prevention in Atlanta were told of the list of forbidden words at a meeting Thursday with senior CDC officials who oversee the budget, according to an analyst who took part in the 90-minute briefing. The forbidden words are \"vulnerable,\" \"entitlement,\" \"diversity,\" \"transgender,\" \"fetus,\" \"evidence-based\" and \"science-based.\" In some instances, the analysts were given alternative phrases. Instead of \"science-based\" or \"evidence-based,\" the suggested phrase is \"CDC bases its recommendations on science in consideration with community standards and wishes,\" the person said. In other cases, no replacement words were immediately offered.\"\n\nAfter report on CDC's forbidden words policy draws outrage, HHS pushes back, Stat\n\nA spokesman for the Health and Human Services Department said Saturday the agency remains committed to the use of outcomes data and scientific evidence in its decisions, pushing back on the characterization of a Washington Post report that the Centers for Disease Control and Prevention is now banned from using words like \"science-based\" and \"transgender\" in budget documents. The spokesman, Matt Lloyd, didn't respond to follow-up questions about whether the policy might apply more broadly, now or in the future, to other HHS agencies such as the Food and Drug Administration or the National Institutes of Health. A separate FDA spokeswoman said earlier on Saturday that the FDA hasn't yet received or implemented a policy to avoid certain words in budget or policy work.\n\n Keith's note: What science-related words might be banned at NASA? \"Science-based\" or \"evidence-based\" seem to be natural ones since CDC can't use them. \"Climate change\" is also a no-brainer since NASA studies a planet called Earth and NOAA and EPA have already had some guidance on that. With regard to Astrobiology \"origin and evolution of life\" might be a ripe target too. On the other hand, maybe we'll get lucky and NASA will be forced to stop saying \"notional\" on every powerpoint slide they show and say \"we're just guessing\" instead. This page contains a single entry by Keith Cowing published on December 16, 2017 10:10 PM. Apply Now To Be On The National Space Council Users' Advisory Group was the previous entry in this blog. Bigelow Aerospace Had a Secret DoD UFO Study Contract (Update) is the next entry in this blog.